This event conjures up many different things for many people. For some, it’s all about getting as many contacts as possible in the time allotted. For others, it’s the social time spent on the breaks between CW, PSK, RTTY or Phone contacts. For others, it might be just hanging out with fellow hams, having a few sodas, some food and fun. The ARRL-sponsored Field Day is held the 4th full weekend in June. 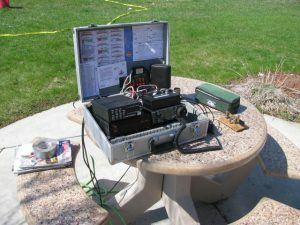 Members are encouraged to get OUT in the FIELD – setting up stations with portable power and antennas, trying new modes, and giving community members a chance to see what amateur radio is all about. Field Day is also a great way to update your communication skills, whether they will be used to support a bike race or fun run, or in the event of an actual emergency or natural disaster. You can read all about the annual Field Day festivities at the ARRL Web Site.